Here is Bodine, the cat who fears nothing and blames the dogs for everything. 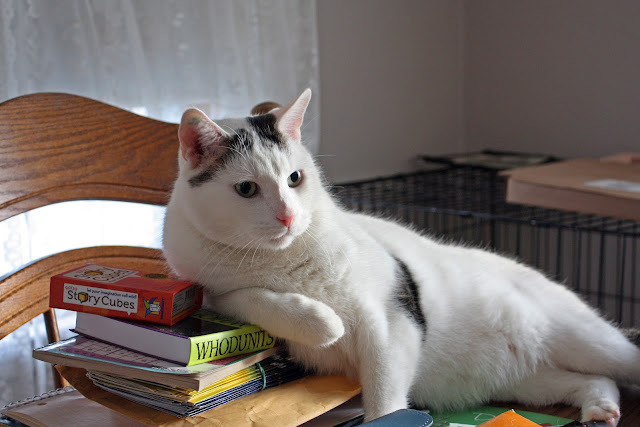 Noting that casual pose with the elbow resting on the detective book, he reminds of a feline Sherlock Holmes. It's rather elementary, you stoopid dogs. I might caption this Whodunit, indeed. Nothin' smarter than a cat with lots of 'book learnin'...what a sweet photo! Some responses when I posted this on Facebook . . .
You got a problem with what I'm reading? He's won trophies for his insticts alone, If you got a purr out of him you would put it on your resume', Even dogs admire him, He is . . . the Most Interesting Cat in the World. How cute is he!! When I read the title of todays blog.... I thought maybe you invented another species... canine, feline and bodine!